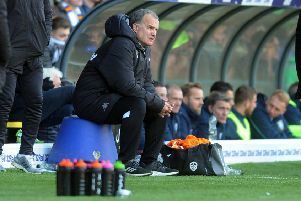 Head coach Marcelo Bielsa praised the performances of several of his players after seeing Leeds United hold onto top spot with a 3-0 victory at Norwich City. On a ground where the Whites have often struggled they took command in the first half and ran out convincing winners to make it four wins from five matches in the Sky Bet Championship. Norwich manager Daniel Farke reckoned Leeds were the best side in the league right now while Bielsa said big performances from Kalvin Phillips, Ezgjan Alioski and defenders Barry Douglas and Pontus Jansson were key to the latest success for a side clearly impressing everyone so far. For Phillips and Alioski it was a contrast and a great reaction after both had been taken off early in the previous game at Swansea, with the latter one of the Whites’ scorers and having a hand in another. “We needed the individual performances of Alioski, Phillips and Douglas,” Bielsa said. “The performance of Jansson was very positive too. Norwich made a bright start, but the closest they came was when Jansson made a great sliding block to deny Teemu Pukki. Leeds settled into their attacking pressing style went ahead when Pablo Hernandez produced a brilliant cross on the run that was met by the head of Alioski and although keeper Tim Krul saved, Mateusz Klich was in attack to follow up by scoring his third goal of the season. A smart move led to a second goal with Douglas and Klich involved before Kemar Roofe’s pass sent Alioski clear to beat Krul at his near post with a powerful shot. It could have been three as Samu Saiz fired over while at the other end Phillips came up with a grave block to divert a Pukki shot wide. Leeds were back on top after the break and Saiz squandered a fine chance when hitting the side netting from inside the box following a Roofe cutback from another fine Hernandez pass. Another great piece of play by Hernandez put Leeds 3-0 up in the 67th minute as the Spaniard cut inside from the left with a great first touch opening up space for him to curl a shot into the far corner from just inside the box. Norwich had no answer and could have been further behind when Alioski’s shot was saved by Krul and Saiz’s follow-up effort was blocked. Substitute Patrick Bamford then fired just wide, but Leeds were home and dry for another three points that keep them on top on goal difference over Middlesbrough, their next opponents. Norwich: Krul, Pinto, Leitner (Buendia), Lewis, Klose, Trybull, Pukki, Hernandez, Hanley, Thompson (Stiepermann 82), Rhodes (Srbeny 82). Leeds: Peacock-Farrell, Ayling, Douglas, Jansson, Berardi, Klich, Phillips, Alioski, Hernandez (Harrison 79), Saiz (Baker 89), Roofe (Bamford 76).